A few places in town have special meaning to me because I watched them grow from the ground up. I had the great fortune to be at ground zero while Li’l Benny’s Smokehouse came into being. From time to time, Li’l Benny’s offers specials and deals. 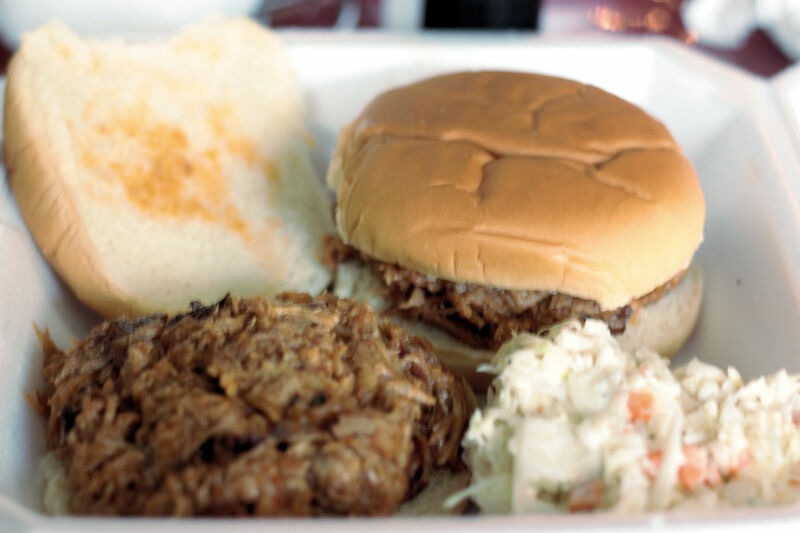 Here was a two BBQ Sandwich plate for $6 with an added side of slaw. Very filling and a nice quick lunch. Photo by Doug Deal. Long before the restaurant opened, I had several opportunities to taste Ben Burks’ recipes. I happened to work with his wife and she would bring in samples of his food from time to time which was always a nice treat. Long hours of tweaking the recipe slowly evolved into what is served today, some of the best ribs, BBQ and smoked chicken anywhere. Just talking to Ben, it is clear how much he loves his food and his customers. His enthusiasm truly comes through in the quality of every one of his dishes. The ribs literally melt in your mouth and the explosive flavor of the smokiness and glaze leave an impression you will never forget. These come served in the restaurant hot on a plate with two sides or alone. They can also be taken home in a refrigerated pack that reheats in the oven quickly and with no trouble. If you have found that you don’t like ribs because they are difficult to eat, or because you have to pull the meat forcibly off the bone, be ready to experience an epiphany as the meat on Benny’s ribs slides right off. 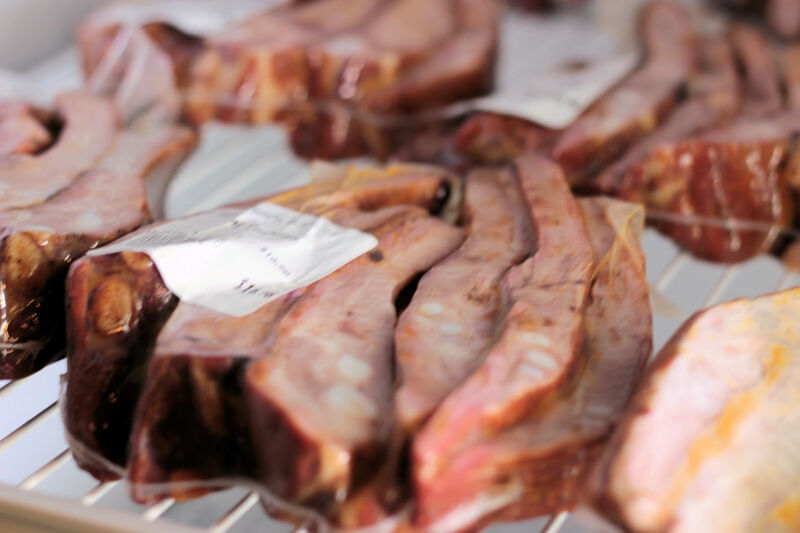 Li’l Benny’s Smokehouse offers their outstanding ribs to go in their takeaway packs. Just heat these quickly in the oven and you are good to go for an outstanding family meal, or reheat them on the grill for a nice picnic. Photo by Doug Deal. For those who want something unique, try their smoked chicken salad, either as an entrée or in a takeaway pack. The smokiness of the chicken comes through in every bite, but it is not in the least bit overwhelming. The smoky flavor enhances the taste, but it is mellowed by the creaminess of the wet ingredients to a perfect balance. Every time I’ve picked this up and shared it with another they’ve been instant fans. I’ve never had anything like it in Macon or anywhere else for that matter. If you order a takeaway pack I suggest serving it with crackers for a nice appetizer or snack. You can serve it on a plate for a lower carb entrée or just make sandwiches for lunch and be the envy of your coworkers. No matter how you eat it, you’ll end up craving it and asking for more. 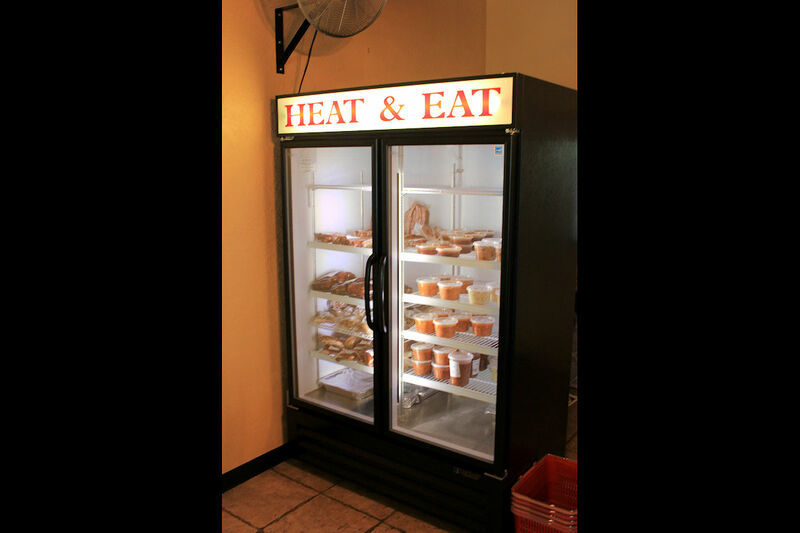 Li’l Benny’s Smokehouse has their food to go in convenient packs that are ready to reheat. On the way home or out for a picnic, you can pick up a pack and reheat them in the oven in a crock on the grill. Try it in a sous vide for the perfect serving temperature. Photo by Doug Deal. The sides are also all excellent quality. I am a fan of sweet coleslaw, but Li’l Benny’s has a more savory variety that I still love, especially spread on top of a BBQ sandwich. The slightly tart flavor and crunch really add something, and it is also excellent straight as a normal side. You should try it both ways. 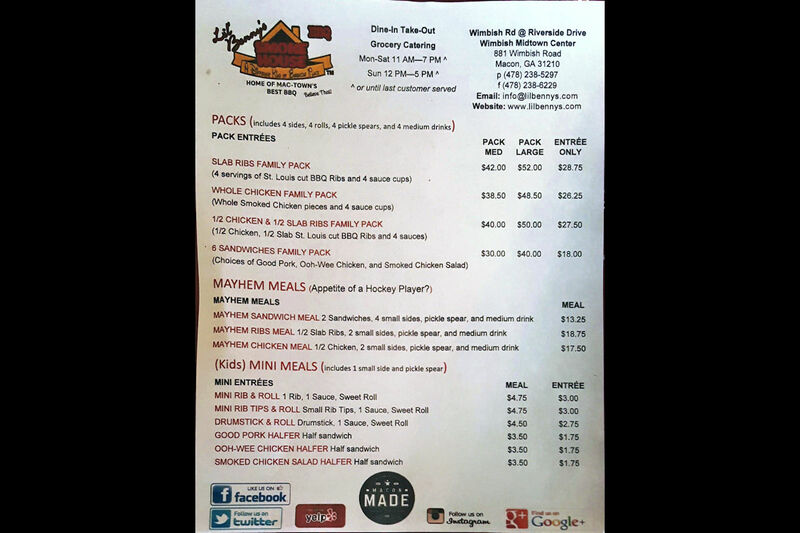 You can also choose from smoked potato salad as well as your traditional sides like green beans, mac n cheese and Brunswick stew. 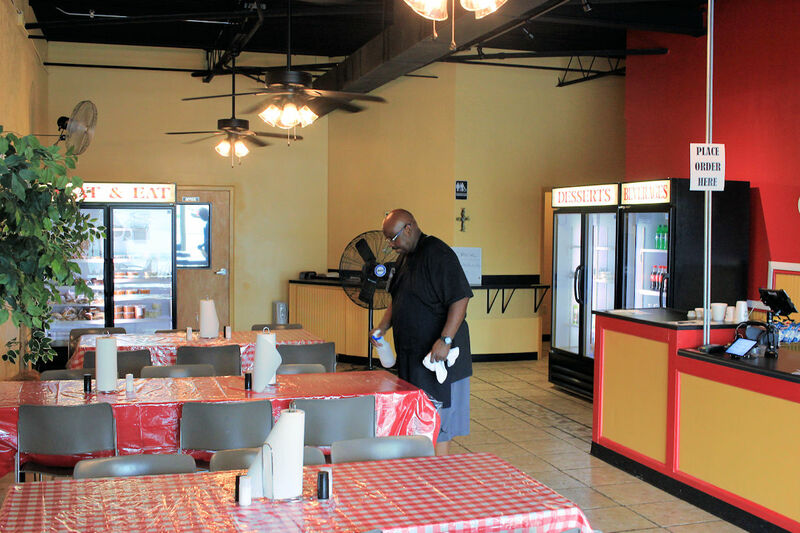 Proprietor Ben Burks gets the dining room ready before lunchtime. Li’l Benny’s offers dine-in, takeout and takeaway packs to satisfy your BBQ, ribs and smoked chicken cravings. Photo by Doug Deal. On this visit, though, I went for lunch and was offered a two BBQ sandwich entrée for $6 and upped the order with a drink and side of slaw. The sandwiches were huge and more than filling for someone my size all for the price of a combo at a fast food restaurant, but much more satisfying and several steps up in the quality of food. 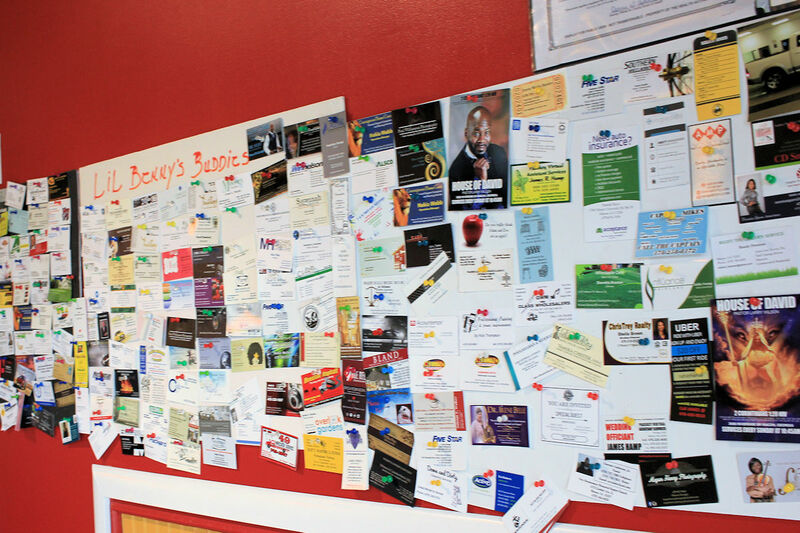 Li’l Benny’s has had great support from the community as evidenced by their buddies board. Photo by Doug Deal. It isn’t flashy place, and it can be hard to find. Li’l Benny’s is tucked away behind Suntrust and Mikado Japanese Steakhouse on the corner of Wimbish and Riverside, but is well worth the effort to find. As you can see by the consistent 100% health score on the wall, they take health and cleanliness very seriously, as seriously as the quality of their food. 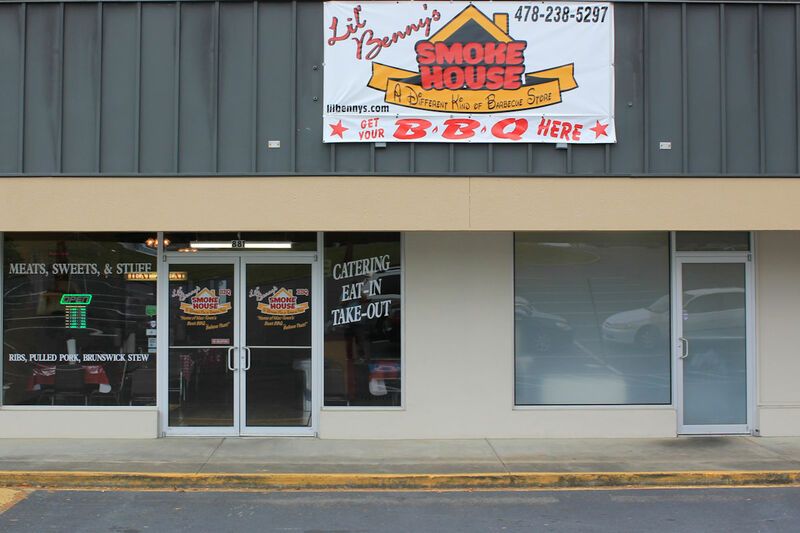 Everyone I know passing through town who asks me about a great place to get ribs and BBQ in town, I always think of Li’l Benny’s Smokehouse. Give them a try. 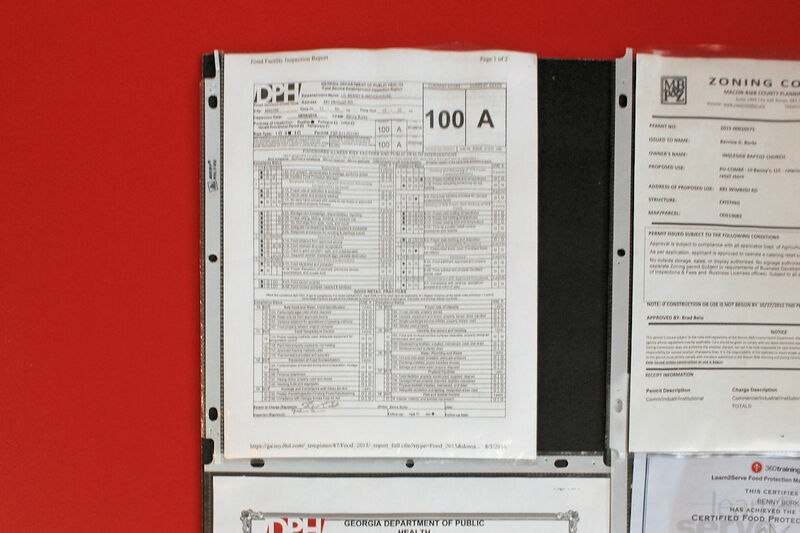 Ben Burks is serious about health and cleanliness, I always expect to see a 100% posted in their restaurant. Photo by Doug Deal. Li’l Benny’s menu page 2. Photo by Doug Deal. 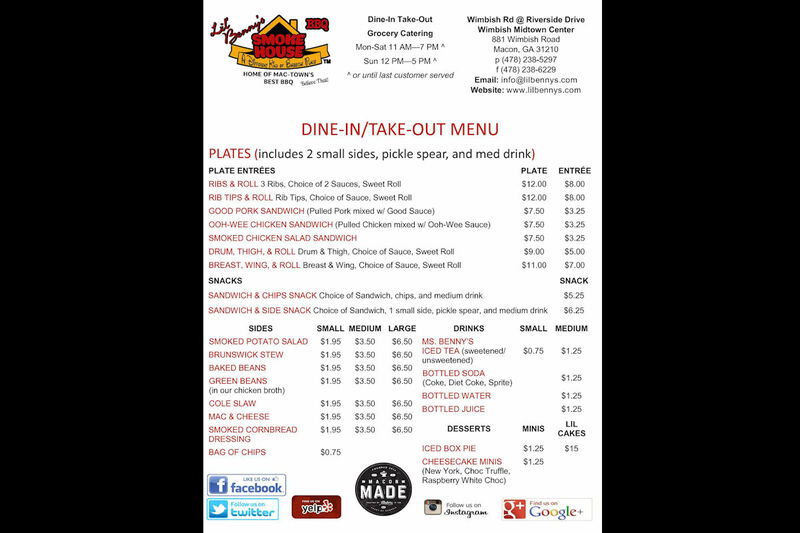 Li’l Benny’s Smokehouse Menu Page 1. Photo by Doug Deal.